The visitors of the San Francisco Museum of Art can these days have a look at what will be the next major historical acquisition of contemporary art by the museum. Ethiopian-born Julie Mehretu was commissioned by the museum to create not one but two monumental pieces for their space. Each of the panels measures 8.2 x 9.6 meters : a true oddity not only for contemporary art but for art in general. In order to be able to work on such a scale, the artist has had to move her studio to a place able to cater for this format. And guess what, only an abandoned church was able to fit the bill. On top of finding an extra-large space, Mehretu also had to adapt her tools to a larger than life scale. This involved using a mechanical lift, armed with broom-like brushes to bring life to her paintings. In the making for several months, the paintings were finally unveiled on Sept.2 at SFMOMA. But they are yet to be completed by the artist who finishes them in the museum space which then also acts as a performance for the visitors. The long awaited result is stunning, and acclaimed by the visitors, art lovers or professionals. The base of the paintings are made of superimposed images of the American West conquest and the most recent riots following the shooting of black men – questioning for who the American dream makes sense… and where it has gone. 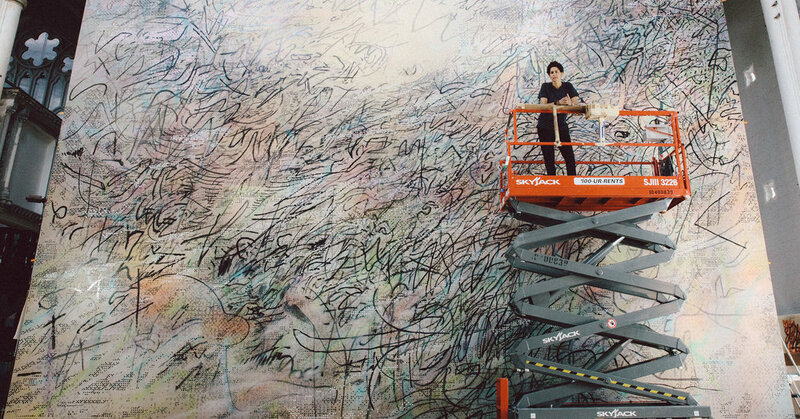 Over these layers, Julie Mehretu has added an infinite number of strokes, looking like calligraphy and lines mixed with undistinguishable patterns. It is this part which is being finished as we speak, under the eyes of the public and staff of SFMOMA. The final result for “Howl, eon (I, II)” is yet to be seen.